If you are looking for trouble… you came to the right place! Here you have the most scary Pumpkin Puree. Dare to try it at night and you will have the most horrible nightmares. Dare to try it for lunch and maybe you don’t get to see the sunset. Only if you eat it during Halloween, nothing will harm you. So, get your pumpkin ready and be careful with real spiders! Did I sound too frightening? He, he, just getting into the mood! This is my entry for this month’s Royal Foodie Joust at the LeftoverQueen :D. I really didn’t know what to do with the 3 ingredients: Pumpkin, beer and sugar, but finally inspiration came :D.
The Royal Foodie Joust is one of my favourite Events, it’s lots of fun, it makes you think and improve your cooking skills and if you are lucky enough… you get a prize/prizes!!!! Join us and get into the Halloween mood too! 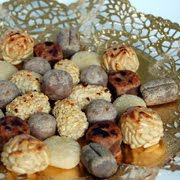 Follow this link to get the recipe for Panellets! Ingredients for 4 servings: For the puree --1 Pumpkin (aprox 1 kilo), 4 carrots, 1 green fresh onion, olive oil, chicken stock, salt and black ground pepper. For the Spider Web: 200 grs of brown sugar and 4 tablespoons of black beer. Peel the pumpkin: seeds off and peel too. Cut in dices and reserve. Peel the carrots and cut in slices. reserve. Peel the onion and chop in small pieces. Reserve. Get some chicken stock in the heat (aprox. half a liter). 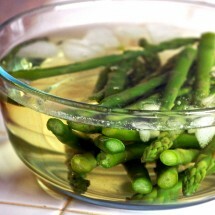 Pour 4 to 5 tablespoons inside a medium pot and heat. Place the pumpkin, carrots and onion inside. Stir while it cooks until onion gets transparent, then add enough chicken stock to let it all simmer. Once the pumpin and carrot are tender. Use a food blender to get the puree texture. If you need more chicken stock add it then. Taste and add salt if necessary. Pour some black ground pepper. Reserve. Prepare some oven's paper on the clean kitchen counter. Pour the sugar in another pot and turn heat on. When the sugar starts melting add the beer and stir all the time until it all melts and reduces a bit. I had it for 3 to 5 minutes aprox. 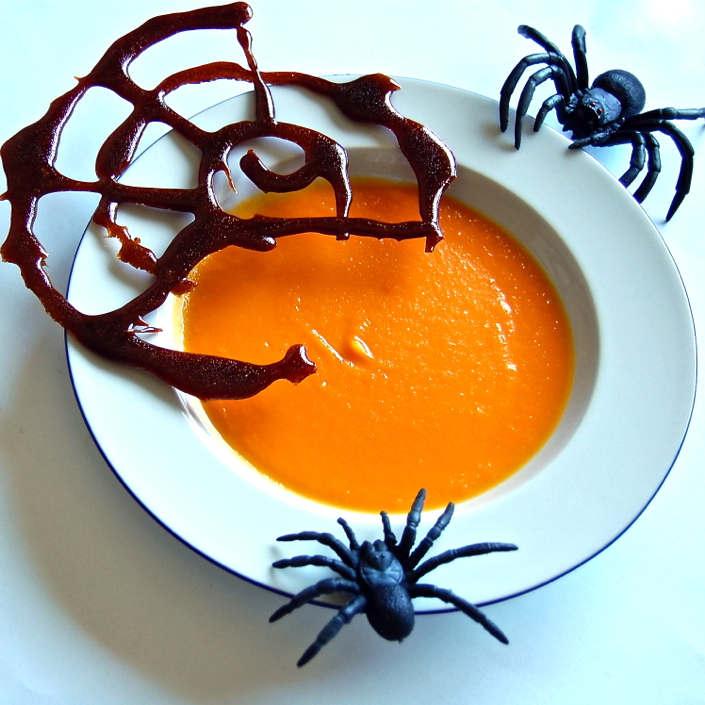 While you are still stirring, take a spoon and pour the reduction over the oven's paper drawing a spider web. Let it cool. Place in the freezer if you are in a hurry. Prepare the plates with the puree in the bottom and the web over them. 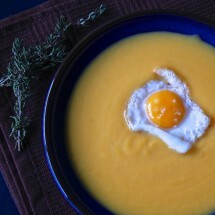 What a great pumpkin soup. Love all the pics. So cute for Halloween. I love the beer reduction spider web, very neat! 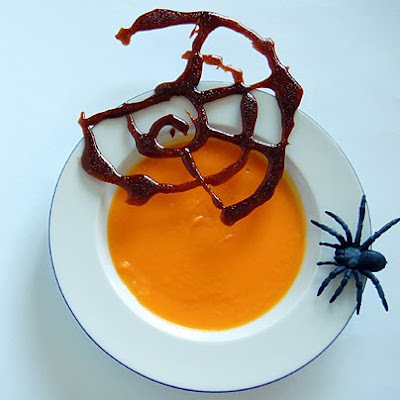 Wow, what a great looking Halloween dish! That beets spider web looks so pretty! Well done Nuria, very scary but creative and in the spirit of Halloween. I love your entry Nuria! It is very inspired by the season! Your photo wonderful! That is going to be hard to beat! Great! In keeping with Halloween and all things supernatural, I am looking my crystal ball and I spy the winner. It’s Spanish Recipes. Nuria, This is beautiful! I love what you’ve done here!! 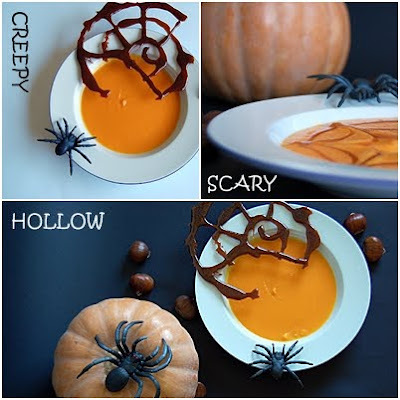 A very fun and creative Halloween idea. You Europeans miss out on it but you have Carnival…OLE! Ha! I LOVE this, Nuria. 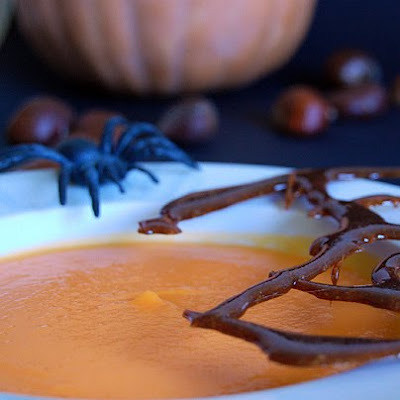 It seems only desserts get transformed into ghoulish treats, so it’s especially refreshing to see a ghoulish savory dish. Happy Hauntings! What a creative presentation! Fantastic! Youmade me laugh out loud Nuria! Love your introduction!! Very clever entry indeed … love the color and flavor and the web looks amazing. Best of luck! 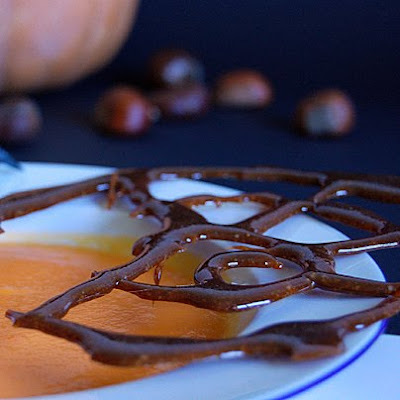 muy chulas las fotos y las receta dan ganas de probarlas!! hahaha thats a crazy looking dish!! i think it’s great! !